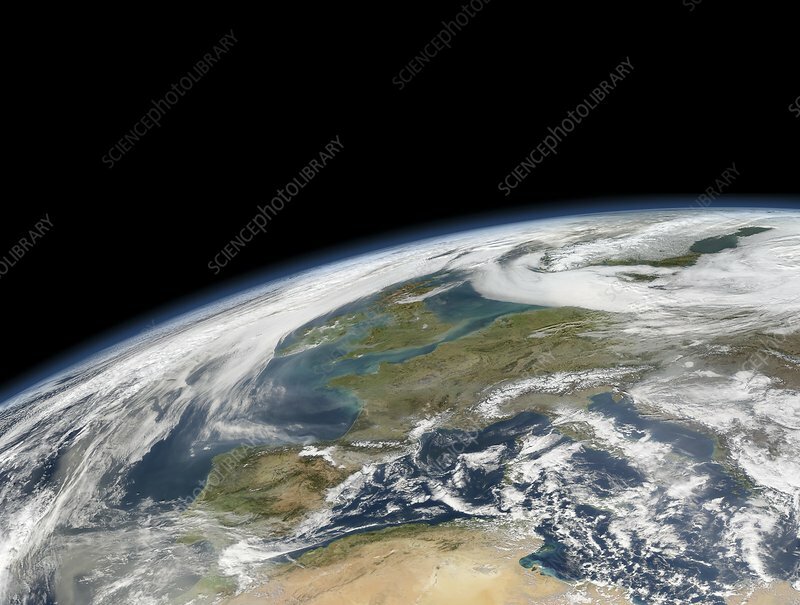 Western Europe, satellite image. North is towards upper right. Clouds are white, seen mostly over the North Atlantic, North Sea and Mediterranean. Snow and ice are seen on the mountains of the Alps and Pyrenees and Scandinavia. Desert areas (brown) are seen in North Africa (across bottom), while vegetation (green) dominates in Western Europe (across centre). Water colours (such as around the UK) include algal blooms and river sediments. Image data obtained on 11 February 2008, by the Moderate-resolution Imaging Spectroradiometer (MODIS) instrument on NASA's Aqua satellite, part of the Earth Observing System (EOS).